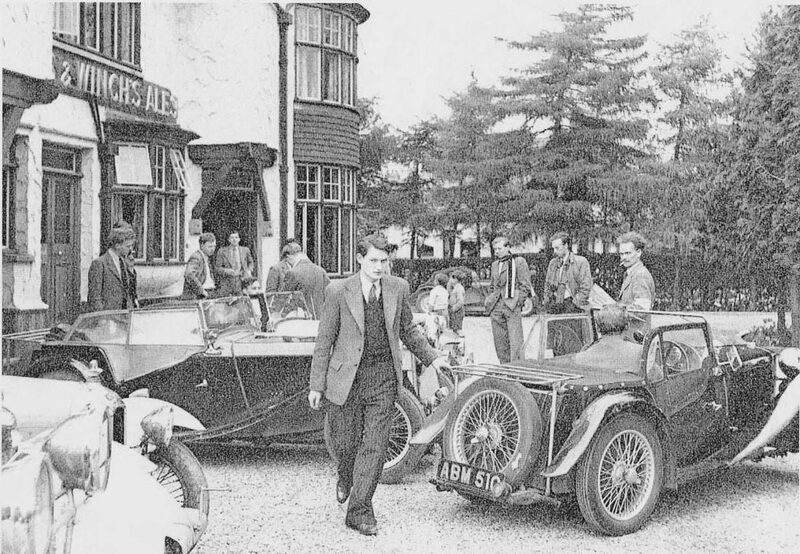 The roots of CCC date back to the 1930s and the Cambridge & County Motor Club. The trophy awarded to the winners of the Cambridge Stages Rally dates from this era and is known as the County Cup. 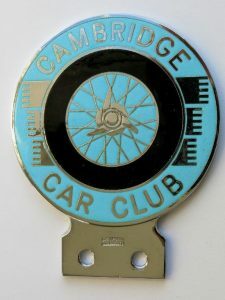 The club effectively closed down during WWII but was re-formed in 1950 as the Cambridge ’50 Car Club, later shortened to Cambridge Car Club. It used to meet at the Milton Arms in Cambridge, where these photos were taken. 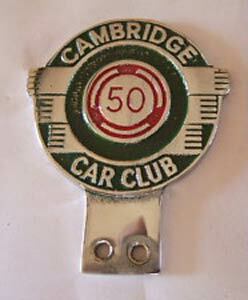 A metal car badge shows the club logo of the Cambridge ’50 Car Club era and one from the following era when cars still had badge bars. 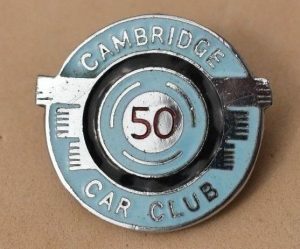 There is also a lapel Badge from the CCC50 time – (click on the pictures for full size versions). We have a large collection of photos from 1950-1953. We are still in the process of loading them onto the website and labelling them so the album will grow in the coming weeks (30/11/18). One of the regular events in the 1950s and 60s was a speed trial, often held on the tracks of the disused airfield at Bottisham. In 1957 this was won by a C.Chapman. Colin Chapman was the founder of Lotus Cars, located at Hethel in Norfolk, and would have been developing the Lotus Mk6 around that time. We have been unable to determine however if it was Colin who was the winner of our speed trial – we have contacted Team Lotus but their records do not go back that far. If anyone has any further information please get in touch with us. In 1979 the financial and legal status of the the club was formalised by the creation of a limited company, Cambridge Car Club Ltd., and it remains so to this day. The club has run a wide variety of motorsport events over the years including sprints, rallycross, stage rallies, autotests and classic car runs. But the most enduring event, organised annually since at least the early 1970s, is the Car Trial (formerly Production Car Trial or PCT). Unusually for a event based on a hill, it used to be held at Bury Lane, Sutton in the Fens! In the late 1970s it moved to its current venue of Claypit Hill, Harlton. 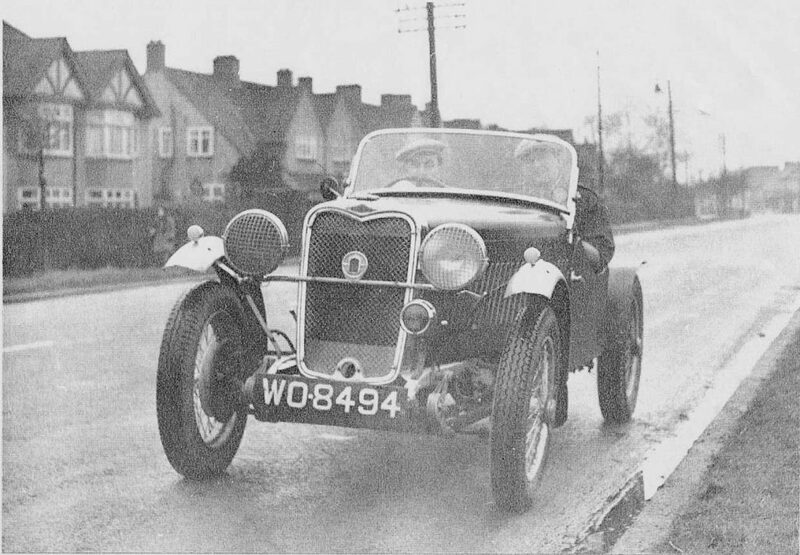 For many years it was known as the Hallen Trophy trial, after the sponsor who provided the cup for the winner. In 2003 a long standing club member and enthusiastic trial competitor, Roger Holmes, died suddenly. It was decided to rename the event in his honour and the Roger Holmes Trial continues to take place every January.